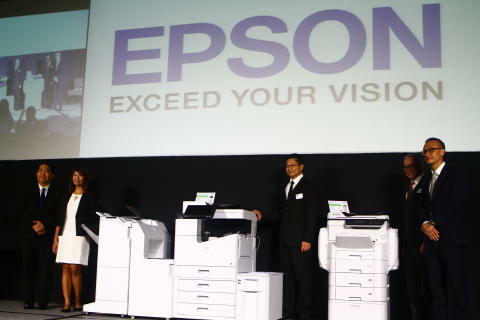 Taguig, July 20, 2017- Epson Philippines is poised to reform business printing protocols for the medium to large enterprise segment with the introduction of the company’s latest printing innovations, the new Replaceable Ink Pack System (RIPS) Business Inkjet printers, the WorkForce Pro WF-C869R and Epson’s first high-speed linehead Multi-Function inkjet printer for enterprise printing, the WorkForce Enterprise series, WF-C20590 and WF-C17590. The new products, unveiled today at Shangri-La at the Fort in Bonifacio Global City, Taguig, promises to provide more options on duplex printing, A3 color printing, as well as high-speed printingin the category where laser copiers remain as traditional tools. The introduction of these Epson Inkjet Multi-Function Printers is projected to contribute an increase in Epson Philippines’s market sharewhich is currently at 51%. It is also another step in Epson’s continuing innovation to improve the customer experience and expand end-user benefits. The WorkForce Pro WF-C869R is now available in all authorized Epson corporate resellers nationwide with a suggested retail price (SRP) of PHP152, 500.00 while the prices for the WorkForce Enterprise series, the WF-C20590 and WF-C17590 are still to be announced. The WorkForce Enterprise series will also be sold through authorized Epson corporate resellers nationwide within this year. Led by the Japan-based Seiko Epson Corporation, the Epson Group comprises more than 72,000 employees in 91 companies around the world, and is proud of its contributions to the communities in which it operates and its ongoing efforts to reduce environmental impacts.